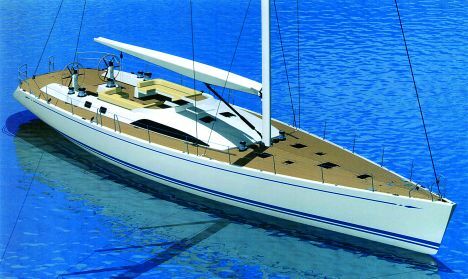 Nautor's Swan repeats the success achieved with the 82FD and 82RS models by proposing the new 82S. This is a yacht somewhere between a Flush Deck and a Raised Saloon, as it has a deck with a characteristic small deckhouse and Semi Raised Saloon that without making the boat look heavy give extra ceiling space for the dinette. The concept remains the same as that characterising the Nautor range; in other words, a high level of performance combined with maximum possible comfort. 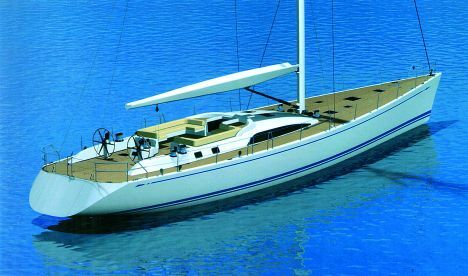 Based on the awareness of having a suitable hull in the boatyard Nautor has merely redesigned the upper deck, leaving the technical and construction characteristics untouched as indicated by German Frers. The hull is made of a single layer of a hybrid fibre composed of glass/aramid, with carbon reinforcements at crucial points. The keel uses a torpedo shaped fin for maximum draft of 3.75 metres. For those needing a deeper keel, for example for different wind conditions, the boatyards supplies a 4.00 metre deep bulb. Performance is not only ensured by the excellent waterlines designed by German Frers, but also by the rig's sail surface. It offers a total of 832.2 sq./m of canvas, comprising 162.9 sq./m of the spanker, 145.3 sq./m of the jib and 523 sq./m of the asymmetric spinnaker. A sail surface that can be increased to 845.7 sq./m if the jib is replaced with a 110% genoa. The main deck is almost completely covered in teak and is characterised by a double cockpit solution; one astern for steering and navigation instrumentation and one dedicated to relaxation with access to the lower deck. The interiors include a spacious dinette in the main area; with a C-shaped sofa and dining table and relaxation corner with an L- shaped sofa and coffee table, which can also be used as a map table. In the bows on this deck there are the crew's quarters, where we have one double cabin, one with bunk beds and a corner for leisure time, as well as the galley complete with all the accessories necessary for long cruises. Whereas astern there is the sleeping area for the owner and his guests; the owner's suite with double bed and small sofas to the sides and two cabins with twin beds. All the cabins have private bathrooms.